A HUGE THANK YOU to everyone who helped us raise a grand total of £12,000 in memory of Mum Veda Stephen. We have donated this to fund a week at the new Maggie Centre at Forth Valley Royal Hospital. Our pet lamb Maggie was born the day the new centre opened on the 15th March. Toffee and Fudge Welcome You! The Witches Craig Highlanders! 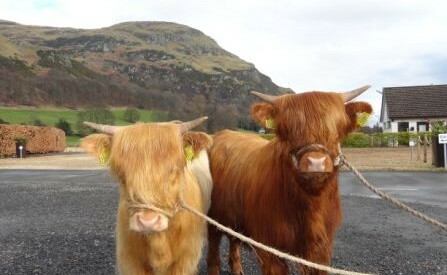 Fudge and Toffee We have our own calves to entertain you during your stay. Here they have been washed and blow dried for the start of the 2017 season!